Nylgut has a specific density and acoustical qualities nearly identical to that of gut, and is the first truly successful synthetic version of the natural product. Please read: the wound strings used for all Aquila ukulele sets such as soprano low G, concert low G, tenor low G, baritone in guitar tuning, and a few other varieties that use a wound string, use a very fine wire wrapping on the wound strings in order to produce their excellent tone. These strings do not have the long life span of the more durable but poor sounding wound strings offered by other manufacturers. 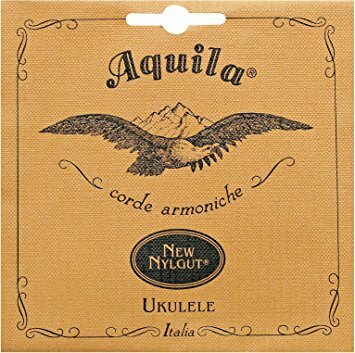 Players who use Aquila ukulele sets with wound strings please be aware that the wound strings will need to be replaced much more often than the plain Nylgut strings that make up the rest of the set. We advise that players purchase 3 or 4 extra single wound strings with every set. When played often a wound string may last only about 1-2 weeks, which is also dependent on the condition of the frets. This is considered to be normal wear for these strings and is not a defective string. Thank you for your understanding. Players who do not want to replace strings as often as this are advised to use Aquila ukulele sets that have all Nylgut strings, which are most sets that have a high g.
The condition of the frets is an extremely important component in this situation. In the case of some of the inexpensive ukuleles, the frets are sometimes not finished very well and have squared off edges, which is part of the reason the ukuleles are inexpensive. Proper fret dressing is a time consuming task that would add to the cost of the instrument. Frets that are rounded and smoothly polished are essential for the best life of Aquila wound ukulele strings as well as making for a much better playing instrument. We encourage players to be sure their frets are smooth, polished to a shiny finish, and well rounded. You will definitely notice a difference in playability.